Lighting impacts how you will enjoy your outdoor living space. Adding deck lighting is easy with Aurora deck lighting. 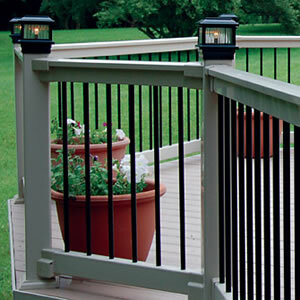 With a variety of styles, sizes and colors, Aurora Deck Lighting has the perfect light for any deck or fence. Lighting is available in three different lighting sources to best fit your deck and fence design needs: low voltage (12v); line voltage (110v); and solar. Most products are available in 11 designer colors to best match your post. All Aurora Deck Lighting Styles are made of rust free aluminum which is then powder coated for a long lasting finish.